PORTLAND, Ore. (February 21)–. 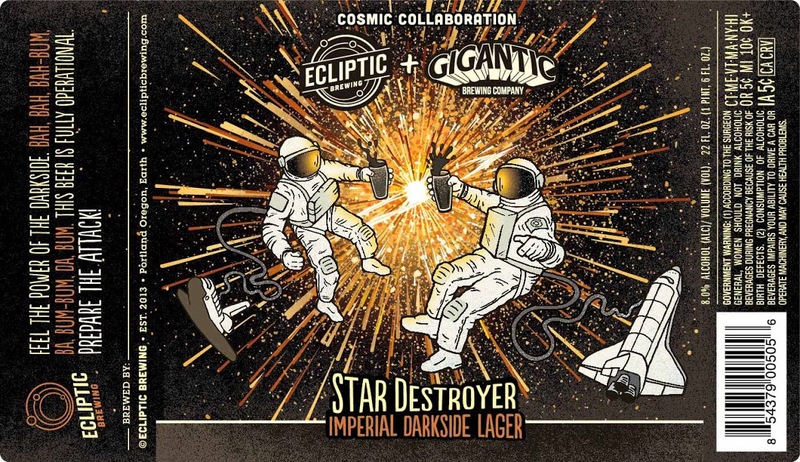 Ecliptic Brewing has partnered with Gigantic Brewing on the newest addition to its Cosmic Collaboration series, Star Destroyer. Brewed in the style of an Imperial Schwarzbier and with a nod to Star Wars, Star Destroyer is cleverly styled as an Imperial Darkside Lager. 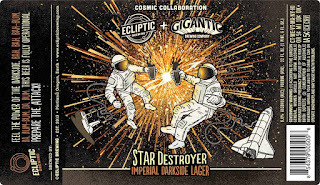 Ecliptic and Gigantic collaborated in 2013 on TicWitTic American Sour Ale, brewed for the opening of Ecliptic. Both breweries knew that another collaboration was bound to happen, but little did they know that a beer brewed to the tunes of The Imperial March would be it. Check out the description of Star Destroyer below. Feel the power of the darkside. Bah, Bah, Bah-Bum, Ba, Bum-Bum, Da, Bum. This beer is fully operational. Prepare the attack. · Ecliptic Brewing, 825 North Cook St. Portland, OR. o Beginning March 1st, 11am. Draft and bottles available. · The Growlerie, 15151 Barrows Rd. Beaverton, OR. o March 13th, 5pm-7pm. Star Destroyer Release Party. · Teku Tavern, 552 Denny Way, Seattle, WA. Ecliptic Brewing is a venture from John Harris, an Oregon beer icon whose background is steeped in the state’s rich craft brewing history. The name Ecliptic unites Harris’ two passions: brewing and astronomy, and as such, the brewery celebrates the Earth’s yearly journey around the sun through both its beer and restaurant menus. Executive chef Michael Molitor rotates his seasonally inspired menu every six weeks in accordance with the old world calendar. Harris’ signature beers include Spectra Hoppy Pilsner, Orbiter IPA, Phobos Single Hop Red Ale, and Capella Porter. For more information, visit: www.eclipticbrewing.com.